If you like rugged countryside and small mountains then you will love this property. Daniel Boone would love this property. This property would remind him of home! That is the kind of person who will want to own this unique property. Someone who loves the outdoors, likes hunting and fishing, wants to be alone, craves privacy, loves adventure, wants to ROUGH IT! BREATH FRESH AIR , cool, crisp and sweet EVERY DAY! 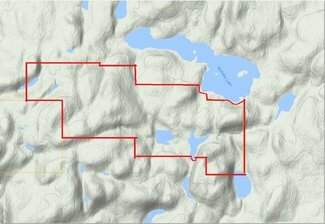 There is very little patented land in this area and to have such a large land holding such as this is a real gem. 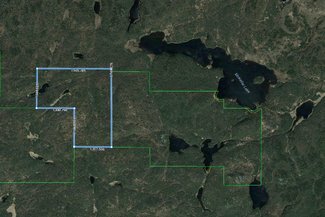 Can you imagine having an opportunity to own a large remote access property in the heart of the WILDLANDS of Northern Ontario? 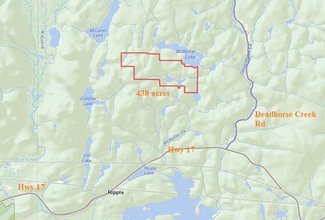 A rare opportunity to possess a large 438 ACRE & exceptionally private holding SURROUNDED BY THOUSANDS OF ACRES OF CROWN LAND in Northern Ontario. Are you passionate about anything outdoors? THIS COULD BE YOUR OWN PRIVATE HUNTING AND FISHING PRESERVE! This property combines everything you love about the outdoors all into one convenient hub. Within an hour of amenities & conveniences of town from both the east and the west YET YOU ARE IN THE MIDDLE OF NOWHERE! 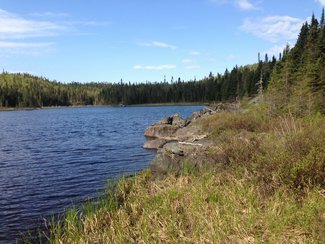 Located in Walsh Township between the Towns of TERRACE BAY and MARATHON in beautiful Northern Ontario, Canada. WALSH TOWNSHIP is AN UNORGANIZED TOWNSHIP! TREE RIGHTS COME WITH THIS PROPERTY (other than the Pine Trees which are reserved to the Crown). 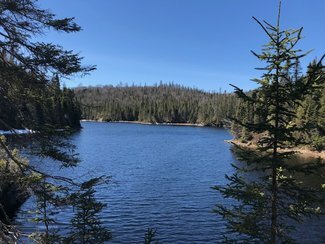 PLUS ON THREE OTHER LAKES! 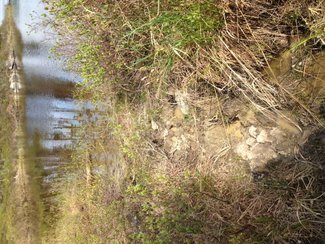 TWO OF THE OTHER LAKES ARE WHOLLY WITHIN THE PROPERTY! 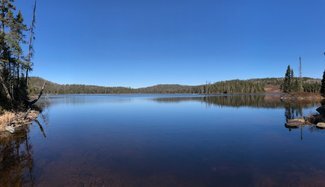 These three lakes ARE UNNAMED. 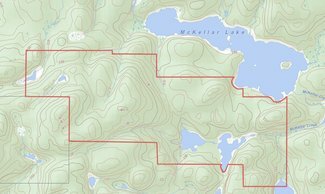 On our maps we refer and identify these lakes as UNNAMED LAKES 1, 2 and 3. 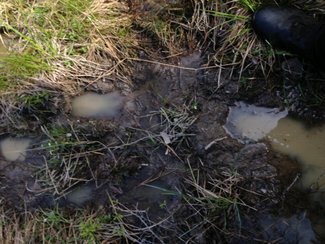 The two lakes that are within your property should be named by you the landowner. 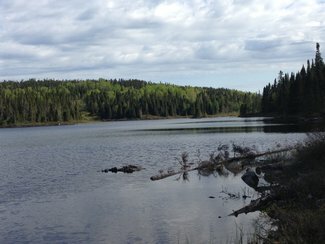 How cool would it be if you named those lakes after your children or grandchildren! 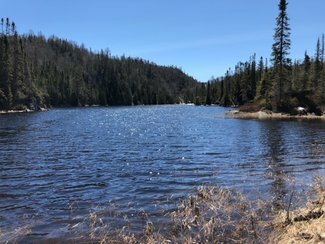 These are CLEAR WATER LAKES and we are told by the MNR that the lakes contain SPECKLE TROUT (BROOK TROUT). 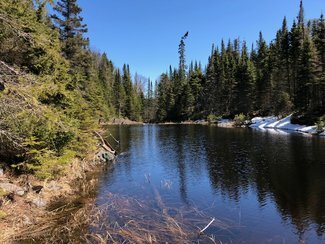 The terrain in this area is such that this is arguably one of the most scenic parcels of land you will find anywhere. 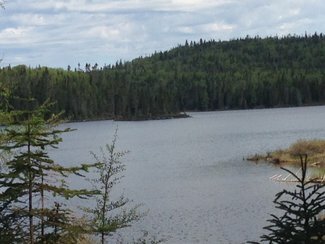 The property is blessed with exceptional views, privacy, recreation opportunity & wildlife. 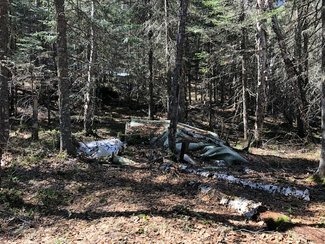 HOW FAR OFF A ROAD IS THIS PROPERTY? The property is really not that far off a road. As the crow flies it is 1.6 kilometers or 1 mile due west of the DEADHORSE CREEK ROAD. 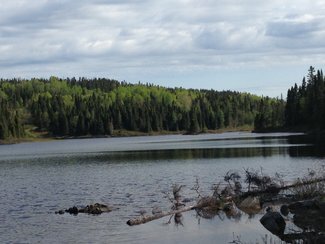 With the trail meandering across creeks, and hilly areas it becomes about a 3 kilometer or almost 2 miles of trail. 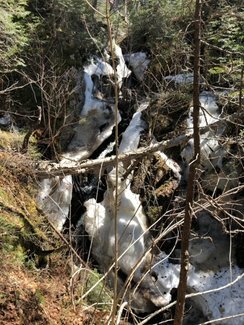 Still a short distance and especially so if you work on the trail and make it into a good ATV/ARGO trail or even a snowmobile trail. 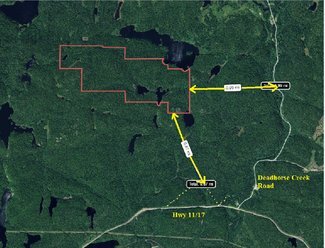 It is 1.75 kilometers or 1.1 miles due north of Highway 17. 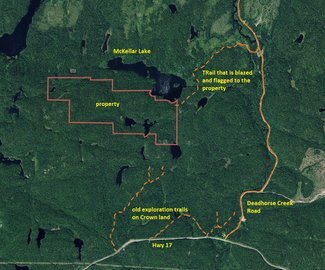 There are old trails made by Mining companies when they were exploring the Crown lands between the highway and this property. Some of those trails are still there and evident. Most likely they would be easier to follow in winter by snowmobile. WHAT CAN YOU DO WITH THIS PROPERTY? 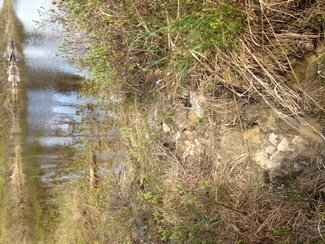 You can fish the two lakes within the property and on the two lakes that the property enjoys frontage on. 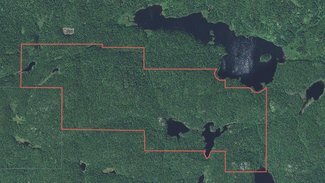 You can hunt on your property plus on the adjoining Crown Lands. Make all kinds of hiking trails. 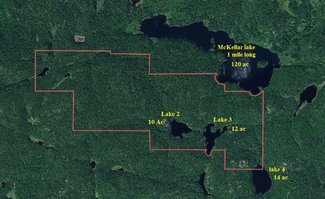 Cut out ATV/ARGO trails throughout the entire property and connect each of the lakes by trails. 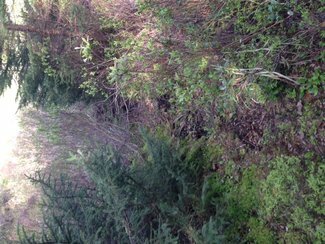 Make a deal with a timber contractor to selectively log your property and the end result will be that you get paid for the timber AND most likely you would end up with a road into your property. HOW DO YOU GET TO THIS PROPERTY? 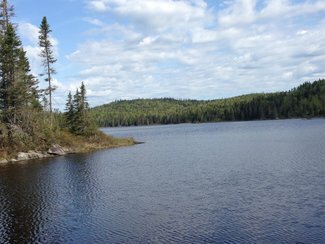 It is easily accessible by float plane where you can land on McKellar Lake. The lake is about a mile and a half long. You can also snowmobile to the property in the winter months. The trail to the property was blazed, well marked with orange flagging tape along the trail, it was brushed out and if you widen the trail a bit you can use an ATV or ARGO to get you to the property in comfort. Enjoy beautiful lakefront views, mountain views and valley views. EVERY TIME YOU COME HERE IT WILL BE AN ADVENTURE! Big Game animals commonly found around this property and in the area are moose, deer and black bear, with Small Game also available. LOCATED IN WMU (Wildlife Management Unit) 21A. 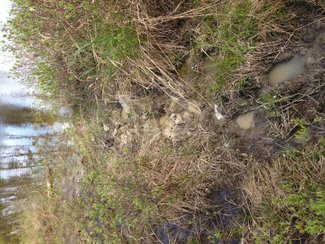 “A review of the Abandoned Mines Information System (AMIS) shows no mines or old mines on the property. 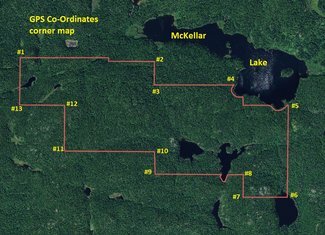 The Abandoned Mines information system (AMIS) is a database containing information on known abandoned mine sites and mine hazard features located on both Crown and privately held lands within the province of Ontario. This includes sites that are abandoned, may possibly be in production or may be covered by a closure plan. It also includes sites under Mining Act, Aggregate Resources Act and Federal jurisdictions. 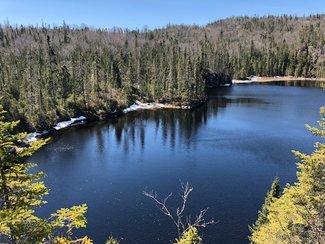 McKellar Lake is located just about 22.2 kilometers or 13.8 miles WEST from the Town of Marathon, in Thunder Bay District, in the province of Ontario, Canada. All your major shopping can be done in either of the two communities. 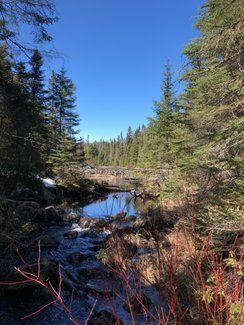 We could write on and on about this property but it is hard to fully describe what an exciting opportunity this is and how beautiful this rugged countryside really is. We could probably claim that this is virgin territory and we could be right. 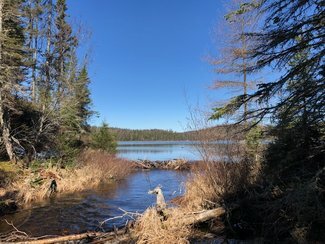 All I know is that if you were camping on this property and on the shore of anyone of the 4 lakes you probably would never see another person in a year or more or ever unless you invited them and showed them how to get there. If a buyer had at least 40% down payment ($100,000) we could most likely have the seller finance the rest on an OPEN MORTGAGE. Talk to us about details on that. YOU CAN USE AND ENJOY YOUR LAND WHILE AT THE SAME TIME IT APPRECIATES IN VALUE YEAR AFTER YEAR!